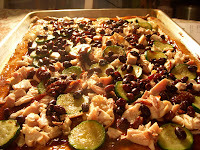 What do you get when you toss together rotisserie chicken, barbecue sauce, black beans and Trader Joe's whole wheat pizza dough? A delicious semi-homemade pizza that doesn't take a lot of time or effort to make. Sometimes it can be a blessing to have a few prepared food items on hand to help you pull together a meal that's kind of good for you but also a bit on the "junk food" side of life. I don't think everything I eat has to be made from scratch, organic or completely fat and carb-free but I do want to continue to eat sensibly and keep the sodium, fat and useless calories down to a minimum. Tonight's meal was an easy to make pizza tossed together in about 30 minutes and was full of veggies, protein and fiber. I'm trying to keep up with the Mark Bittman, Food Matters school of thought - eating vegetarian throughout the day and enjoying chicken and other animal based foodstuffs at night, along with whole grain carbs. Sometimes, I don't want to be Julia Child or Chef Tell but I do want to be a bit more creative than Chef Boyardee or Sandra Lee. I want to be able to make a good meal with a little more effort than opening the refrigerator and seeing what's inside. Tune in and read the recipe. Turn on your ovens and preheat to 400 degrees. Drop out of ordering pizza pizza from the Mama's & Papas or Domino's Sugar Factory. 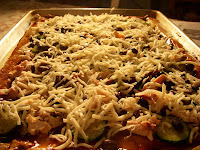 This pizza is a prepared pizza dough topped with sauteed onions and zucchini, chicken, barbecue sauce and cheese. You are in store for a food trip that you can feel good about eating and sharing. Prepare pizza dough. Scatter some flour onto your counter top and roll out to the desired shape and thickness. I used a half-sheet pan onto which I baked the pizza, so I rolled the dough out to the general length and width of my sheet pan. Dust the pizza pan with flour or cornmeal. Place the pizza dough onto the pan, and crimp or fold over the edge onto itself to make a crust. With a pastry brush or your fingers, spread a little olive oil on the crust edge and sprinkle lightly with kosher salt. Set the dough aside. In a medium saute pan, heat 1 tablespoon of olive oil over medium-high heat until the oil begins to shimmer. Lower heat to medium and add in the onions and saute until they begin to caramelize, 8-10 minutes. If the onions begin to cook too quickly, lower heat and add in a pinch of salt to draw out their moisture. When onions are done, remove from pan and set aside to cool slightly. Add 1 teaspoon of olive oil to the pan and turn the heat back to medium high. Saute the zucchini until it is crisp and golden brown - about 5 minutes. Remove from pan and allow to cool. Spread the barbecue sauce onto the pizza dough, as though you were spreading pizza sauce onto it. 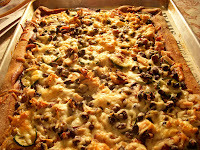 Arrange the onions, zucchini, chicken and black beans all over the pizza dough, keeping them inside the pizza's interior and up to the crust edge. Season with a sprinkle of kosher salt and freshly ground black pepper. Top the pizza with 1 cup (or more if you desire) shredded mozzarella cheese. Bake until the pizza crust edge is puffed up and crispy brown and the cheese is melted, about 10-15 minutes. Rotate the pan once or twice, about every 6 minutes. Allow pizza to cool 5 minutes before cutting.